First Presbyterian Church is committed to the continual development of programs by, for, and with "Boomers and beyond." We realize that life is a continuum of opportunity to learn, share, love, be successful, and grow spiritually. 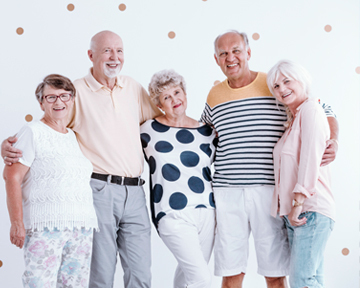 Our programs are open to all seniors, members, and non-members, who are in the middle to late years of life. This group's activities may include nature, art, music, lectures, games, cooking, and eating—and hopefully, always laughter! Some activities will be at the church, while others will be "off-site" and may involve more walking. All are welcome! Transportation, in the church vans, is offered each Sunday for those seniors wishing to attend the 9:00 a.m. worship service. If you would like a ride to church, please call the church office for more information and to sign up. The vans are able to accommodate a limited number of wheelchairs. The Caring Ministry Team and Deacons work together to ensure that our seniors, who are homebound, in a nursing home, or in the hospital receive friendly visits on a regular basis from Deacons and trained members-at-large. Communion is also served monthly by trained elders, trained deacons, and the pastors in order to reach members and non-members in nursing homes, assisted living facilities and private homes.